Champagne Going Down...: Christmas is here! Stopped by the supermarket to pick up some milk and bread and couldn't belive my eyes. I was greeted by a big display of... Chocolate advent calendars!!! No. Take it back. Say you don't mean it. Funny you should say that (type that even). Today I went shopping and right next to the Halloween items were a bunch of Christmas decorations. I was like huh! 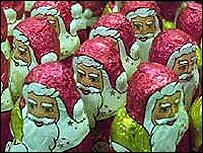 It gets earlier every year I'm sure..
Ohhhh here in Dutchyland we first have "Sinterklaas" (on Dec 5) and first stuff for that appeared in shops earlier this week as well!